I'm Pit. I'm a college student of computer science in Dresden, Germany. Like many of You, I missed a Poker game for the iPod touch and iPhone. As no one seemed to pick it up, I did. That was in March, and now its here. Let me at first thank all my customers who have downloaded THTouch almost 90,000 times. That includes the 2 days of free downloads, which accounted for over 27,000 of the total numbers. They were meant to celebrate the 60,000th download. I recently got myself an iPad and started working on an iPad port, which means some substantial restructuring of the underlying code base and will take up quite a bit of time, next to exams, internships, etc., so stay tuned. If you still have any questions or requests, feel free to contact me at the email address on the right. Thank you! 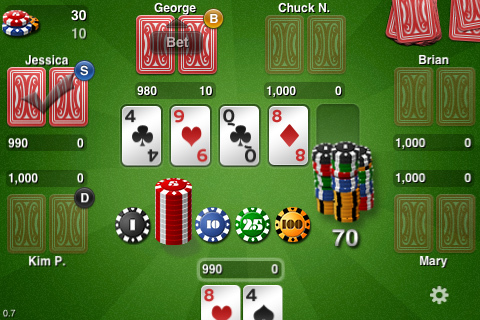 A: A game of Texas Hold'em Poker for the iPhone and iPod touch. A: Not yet in the first release, but I have plans to add it later. A: You may help by translating text strings into your native language. I'll hand you the necessary files if you contact me.